Today at my Weight Watcher meeting I am going to give away some kits using retired paper to make journaling card pockets. As you can see, I did come up with some other projects on my to do list to distract me. 1. Happenings Simply Created Kit. See this video of the first few cards I made. I love this kit. 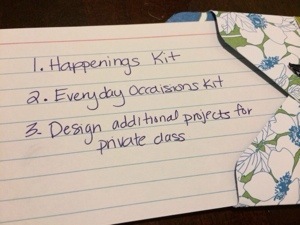 2.Everyday Occasions Kit. I’ve seen the cutest cards come from this kit and can’t wait to play. 3. 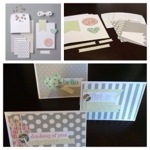 I have 2 more projects to design on for an upcoming private class. I love sharing crafting with people who say they could never make anything pretty. I accept that challenge! 4. I should have My Paper Pumpkin in my mailbox any day. I look forward to this 30 min escape every month. These are always quick projects delivered right to your mailbox. This entry was posted in Uncategorized on February 22, 2014 by katzcreates.